As official swim brand partner, Zoggs is, once again, supporting Swimathon in 2015 – the world’s biggest fundraising swim – which will see thousands of swimmers making waves and raising funds for Marie Curie by challenging themselves through 5K, 2.5K and 1.5K individual challenges or Team 5K and 1.5K challenges on 17-19 April 2015. Marie Curie is a leading UK charity providing care and support to people living with any terminal illness and their families. Every year the charity cares for around 40,000 people with terminal illnesses out in the community or in one of its nine hospices. 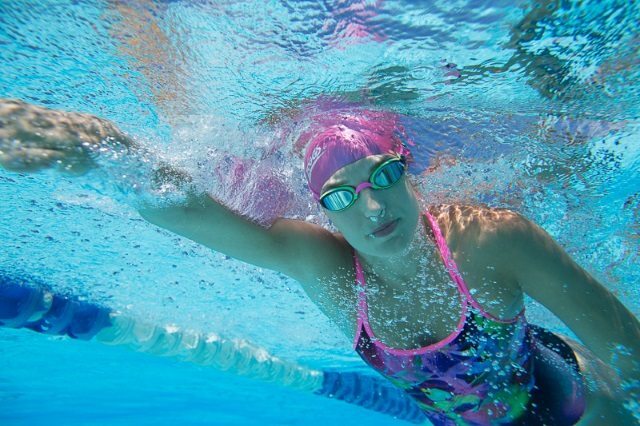 Zoggs will be promoting the event at over 600 pools throughout the UK, supplying every swimmer with a swimming cap and making available limited edition Marie Curie swimming goggles in blue and yellow. Zoggs will be donating £1 to Marie Curie from the sale of every pair of the limited edition Marie Curie goggles. The goggles will be available from participating leisure centres, sports retailers nationwide across the UK and at www.zoggs.com and presented in eye catching packaging and housed in a matching counter top display unit. “It’s a perfect fit for Zoggs as we are passionate about swimming, so being able to get involved in an event like this, which not only raises significant funds for Marie Curie but also encourages everyone – no matter what age, level of fitness or swimming ability – to get in the pool and make some waves, is one the whole swimming community in the UK can get behind,” said David Annand, UK Marketing and PR Manager at Zoggs. The Zoggs Marie Curie swimming goggles will be available from January 2015 at the following RRP: Hero Adult £15 and Hero Junior £10. Swimathon is the world’s biggest fundraising swim, and will take place from 17-19 April 2015. Swimathon started in 1986 and since then more than half a million swimmers have taken part, raising over £40 million for charity. Pools and operators continue to encourage visitors to enter Swimathon, with more than 68% of participants in 2014 hearing about the event through their local swimming pool. Their continued support is extremely important to the success of the event. Swimathon has raised funds for a variety of nominated charities, including Comic Relief, Macmillan Cancer Support, NSPCC, The British Heart Foundation, The Prince’s Trust and, most recently, Marie Curie and The Swimathon Foundation.